On August 6, 2017, at the 17th World Congress of Jewish Studies, Jerusalem, the first plenary session celebrated “70 Years of Discovery of the Dead Sea Scrolls”. The four papers look at various ways in which the Dead Sea Scrolls enhance our knowledge of early Jewish literature. Below are videos of the papers from the “Biblical Exegesis in Second Temple Literature” section of the conference “Biblical Exegesis through the Ages” at Bar-Ilan University on May 9, 2018. Professor Sidnie White Crawford (University of Nebraska-Lincoln) summarises the latest scholarship on the Qumran library of 800-900 fragmentary manuscripts from the mid-third century BCE to the late first century CE, and the history of the sect responsible for the collection and its scribal/learned characteristics. Her public lecture was delivered on January 25, 2018, on the occasion of receiving a D.Theol honoris causa from the University of Uppsala. Professor Lawrence Schiffman (University of Chicago) delivered the 1990 Stroum Lectures in Jewish Studies at the University of Washington, “Creation, Revelation, and Redemption: The Religion of The Dead Sea Scrolls”. The late African biblical scholar Dr. Peter Flint delivers a lecture introducing the Dead Sea Scrolls and their relevance for understanding the New Testament, on January 16, 2012 at El Shaddai Ministries, Tacoma, WA. 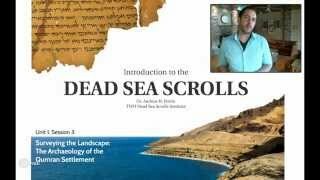 Trinity Western University have made public a series of videos developed primarily for students enrolled in the “Introduction to the Dead Sea Scrolls” (RELS 320) course, lectured by Dr Andrew B. Perrin in 2015. The course provides an introduction to the Dead Sea scrolls within the context of early Judaism. 2.1 Jewish Groups and Qumran Identity: Pharisees, Sadducees, or Essenes? Professor Emanuel Tov delivered a guest lecture in Scott Chapel, Oklahoma Christian University, in April 2014. The topic was the biblical texts among the scrolls at Qumran. A special edition of the 2004 Hayward Lecture series was held on the topic of “Christian Beginnings and the Dead Sea Scrolls”, at Acadia Divinity College. Articles developed from the lecture series were later published in John J. Collins and Craig A. Evans, eds, Christian Beginnings and the Dead Sea Scrolls (Baker Academic, 2006). The following is a talk by Geza Vermes on ‘The Story of the Dead Sea Scrolls’. The Story of the Dead Sea Scrolls, a lecture presented by Professor Geza Vermes at Louisiana State University’s Hill Memorial Library on September 29, 2009. Geza Vermes was born at Mako in Hungary in 1924. He studied in Budapest and in Louvain (Belgium), where he read Theology and Oriental history and languages, and in 1953 obtained a doctorate with a dissertation on the historical framework of the Dead Sea Scrolls. Podcast 5.12: Jesus as Teacher, part 2 – Present or Future Kingdom? Podcast 5.15: Jesus as Messianic King? Podcast 7.1: Visions of the End – What is Apocalypticism? Do you wish to discuss any of the resources on Biblical Studies Online with some biblical scholars? You are welcome to join our affiliate Facebook group, The Annual Meeting Hotel Lobby Group, and post your comments, questions, or suggestions there.